REMEMBER! The LORD wrought the FLOOD because HE was NOT CONTENT. Indeed HE was GRIEVOUSLY DISPLEASED that the THOUGHTS of MEN had become EVIL/ POLLUTED/ CONTENTIOUS CONTINUALLY! (Genesis 6:5 .. Ephesians 2:1-<8-12>- 4:17 .. Isaiah 45:17-46:13, ch.59) Yet because THE FLOOD did NOT culminate an utter END to ALL CONFUSION on EARTH, the RIGHTEOUS LORD is NOT yet APPEASED! It is written, “TOPHET is prepared of OLD!” (Isaiah 30:30-33) When at last ALL INTERNATIONAL CONFUSIONS have come to an END, then will the MOST HIGH say that HIS EFFORTS to bring PEACE on EARTH have NOT been in VAIN! For it is VANITY to BEGIN a task and NOT to bring it to ALL that is its PLANNED FRUITION! For the MOST HIGH created this WORLD that in it there should be PEACE in it EVERLASTING! HIS PURPOSE with regard to PEACE on this EARTH has NOT therefore been accomplished therefore till ALL WARFARE after SELFISHLY AMBITIOUS and UNRIGHTEOUS CONTENTIONS are at last NO MORE! Consider ISAIAH 40:1-<27-41:4>-43:15, 44:20-45:6>-<45:18-46:13. ENOCH 54:1 And AFTER that the HEAD OF DAYS repented and said: ‘In VAIN have I destroyed all who dwell on the earth. ENOCH 54:2 And He sware by His GREAT NAME: ‘Henceforth I will not do so to all who dwell on the earth, 3 but I will set a rainbow sign in the heaven: and this shall be a covenant pledge of good faith, even a REMEMBRANCE between Me and them for ever, so long as heaven is above the earth. NOTE! It is important in reading the passages below to take fully into consideration so as to perceive beyond western bias, what is biblically prophesied concerning what scripture relates is the part the “MEDES” play toward the once and for all fall of the confusions of the nations, the FALL OF BABYLON! Realize that the “wise men” from the East came from Kurdistan to Jerusalem looking for the King of the Jews for a good REASON! (Mat.2:1-2) (Jeremiah 51:1-<11>-<28>-64, Isaiah 13:17-18, See also the text at hiddengosel.com/lamsa Isaiah 19:1-5 ) See the article on this website, “EARLY CHURCH ORIGIN and MUTUAL EXPECTATION“. NOW, BACK-TRACKING A MOMENT FOR REFERENCE’ SAKE, consider these passages from this very book of ENOCH at verses 46:1-3. Let us look at this before again moving forward. ENOCH 46:2 He answered and said to me; … This is the Son of Man to whom righteousness belongs; with whom righteousness has dwelt; and who will reveal all the treasures of that which is concealed; for the Lord of Spirits has chosen Him; and his portion has surpassed all before the Lord of Spiritis in everlasting uprightness. ENOCH 46:3 This SON OF MAN, whom you behold, SHALL RAISE UP KINGS and the MIGHTY from their DWELLING PLACES, and the POWERFUL from their THRONES; and shall LOOSEN the BRIDLES of the POWERFUL, and break in pieces the TEETH/ silence the mouths of SINNERS. 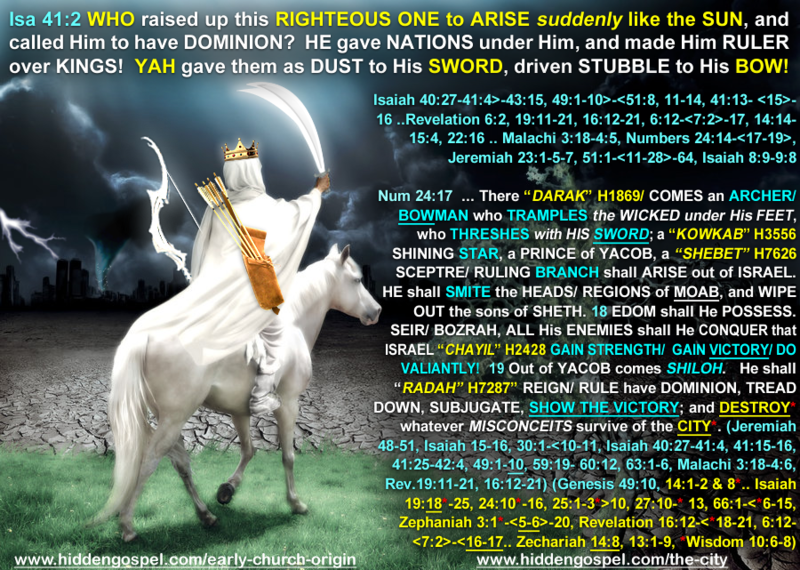 (Isaiah 40:27-41:4, 13:7) 4 He shall hurl KINGS from their THRONES and their DOMINIONS; …. Jer 51:11 Make bright the arrows; gather the shields: the LORD hath raised up the Spirit of the KING OF THE MEDES: for his device is against BABYLON, to DESTROY it; because it is the VENGEANCE of the LORD, the VENGEANCE of HIS TEMPLE. Jer 51:28 Prepare against BABYLON the nations with the KING OF THE MEDES, the captains thereof, and all the rulers thereof, and all the land of his dominion. Isa 45:17 But ISRAEL shall be saved in the LORD with an everlasting SALVATION: ye shall NOT be ASHAMED nor confounded WORLD WITHOUT END!! Isa 45:19 I have NOT spoken in SECRET, in a dark place of the earth: I said NOT unto the seed of Jacob, Seek ye me in VAIN /PARTIALITIES/ BLINDNESS/ CONFUSIONS: for I the LORD speak RIGHTEOUSNESS/ FULLNESS, I declare things that are RIGHTeous. 1 I now began to utter THE THIRD PARABLE, concerning the saints and the elect. 2 Blessed are ye, O saints and elect, for glorious is your lot. 3 That saints shall exist in the light of the sun, and the elect in the light of everlasting life, the days of whose life shall never terminate; nor shall the days of the saints be numbered who seek for light, and obtain righteousness with the Lord of Spirits. 4 Peace be to the saints with the Lord of the world. 5 Henceforward shall the saints be told to seek in HEAVEN the secrets of RIGHTEOUSNESS, the portion of FAITH; for like the SUN has it ARISEN upon the earth, while DARKNESS has passed away. There shall be light which cannot be numbered; nor shall they enter upon the enumeration of time: for darkness shall be previously destroyed, and light shall increase before the Lord of Spirits; before the Lord of Spirits shall the light of uprightness increase for ever. NOTE! There is yet more to be said with regard to prophecies regarding what will indeed be at the ONSET, DURING and AFTER the MILLENIA REIGN of PEACE when for a moment as it is prophesied, the adversary who has been imprisoned for a time will be loosed, and all his armies defeated unto what then will be the absolute end of all confusions on earth unto a reign of EVERLASTING UNINTERRUPTED PEACE! The answers of which I speak are as related at EZEKIEL CHAPTER 38 and as reiterated again at REVELATION 20:7-10. All these things need be considered in discerning ALL that has been foretold. WHO is the POST- MILLENIUM peoples called GOG and MAGOG? There is much to say as to what other EASTERN texts in ARAMAIC historically say concerning a people whereby “a people of the NEARER EAST being troubled by a people of the FARTHER EAST requested of one carrying the title D’HUL KARNEIN. Requests were made that a WALL be created to DIVIDE the peoples of the FARTHER EAST from a peoples of the NEARER EAST. The peoples bordering in the FARTHER EAST in accord to those texts are called GOG and MAGOG. Concerning these things I will write further elaboration time allowing in the days to come. For it is prepared of the MOST HIGH that after the millenia reign, wherever among all the peoples and nations, there be anyone who would be provoked to stand against the PEACE that YAH has planned for HIS PEOPLE, they shall be vanquished that EVERLASTING PEACE shall endure. ;) I will revisit yet again since I bookmarked it.